We analyzed ten years of March Madness upsets and first round data to assist you in identifying this year’s upsets in the tournament’s first round and beyond. Upsets are synonymous with the NCAA Men’s Division I Basketball Tournament. They’ve become much more common over the last several years as the NCAA has seen much more parity from team to team. Last year when tiny UMBC blew out Virginia by 20 points, 74-54, that team become the first #16 seed in the history of March Madness to take down a #1 seed. With that history-making upset, the hopes of a perfect bracket among the millions of printed brackets were ruined. Still, the quest for the perfect bracket continues this March Madness. How do you get the perfect bracket? It takes a lot of luck, but also involves some skill too. We looked at the past 10 NCAA tournaments to identify 2019’s Cinderella stories. 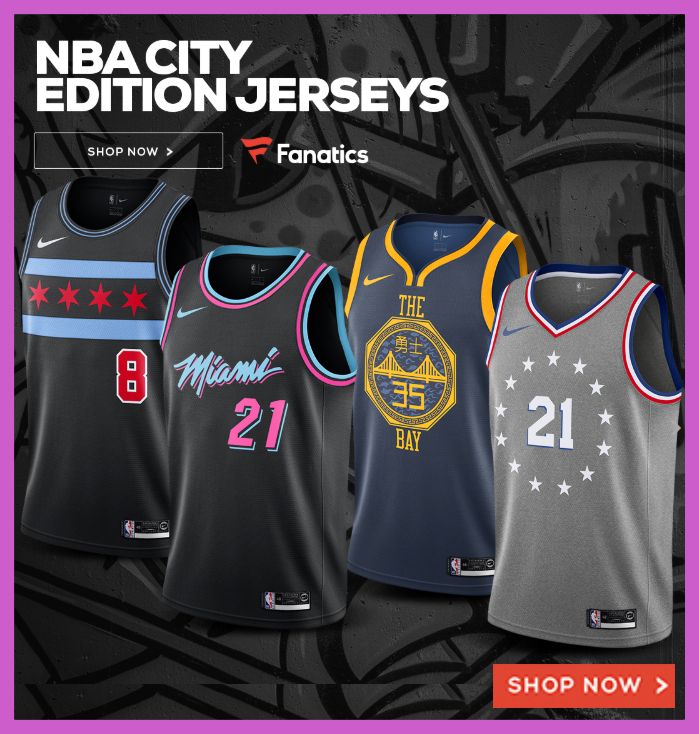 Whether you’re downloading and printing out your own bracket or selecting your college basketball bets online, Betway have identified some trends that will advise you on which teams to choose. Here’s 12 tips in how best to predict the most-likely upsets in this year’s March Madness bracket. 1. There’s been 72 First Round Upsets the Last 10 Years In defining an “upset”, we are only considering a first-round upset as any team seeded 10th or lower winning their game against the higher seed. Look, a #9 seed taking down a #8 isn’t sending shock waves across the nation. With that in mind, the last 10 NCAA tournaments has seen 72 such upsets. Divided out by the decade of data we have, that’s an average of approximately seven upsets per year. 2. Choose 6-8 Upsets in the First Round With that data in mind, we also learned that there have been no fewer than five upsets in any given first round bracket, and no more than ten upsets in one tournament. That’s a great clue so when you’re picking your teams, not to get too much into the March Madness and predicting too many upsets in the first round. Choosing somewhere between 5-8 upsets feels right. Choose wisely. 3. Don’t Pick the 1/16 or 2/15 as your Upsets We started this article with UMBC defeating the #1 seed, but that’s unlikely going to happen again anytime soon. That’s to say don’t waste any of your first round upset choices on a #1 or #2 seed being upset. (Only eight # 15 seeds have ever advanced past the first round). So by deducing this data, the question comes down to which teams seeded between #10-#14 will upset seeds #3-7. When it comes down to it, you’re choosing your 6-8 first round upsets out of 16 games. 5. Choose 1 Team from First Four The First Four was introduced in 2011 and is a series of play-in games where the lowest seeds have to win an additional game to play into the bigger 64 bracket field. Choosing one of these teams is apparently an excellent chance because one of these First Four have went onto win in the first round of the tournament since the NCAA announced the First Four. 6. Pick the Mid-Major Champions Generally speaking, the lowest seeds come from a two buckets: either they’re a mid-major conference champion or they’re teams that finished lower in the standings in major conferences. When it comes to first-round upsets, teams from the mid-majors are the ones to really watch; that’s because in the last decade, 44 of the 72 upsets in the first-round originated from one of these mid-major teams. 7. Conference Confidence: Atlantic 10 and Conference USA Want to get deeper into which Mid-Majors are causing a stir? The Atlantic 10 is the conference with the most 1st round upsets with eight while the Conference USA champions having advanced to the Round of 32 in each of the past four years. With more upsets, the Atlantic 10 and Conference USA might be moving up from their Mid-Major category. 8. Ohio in a State of NCAA Upsets While we don’t think any state has a monopoly on upsets – we think that surprise teams are spread fairly evenly across America, we did notice that the State of Ohio is often where upsets come from. 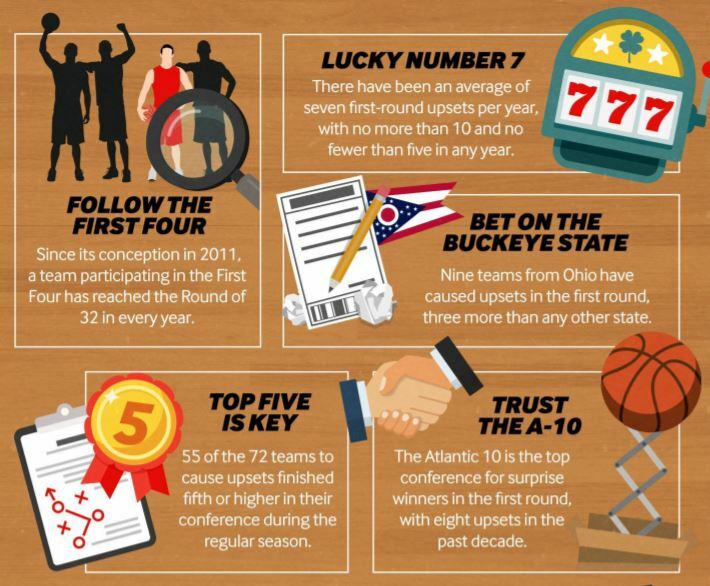 Nine teams seeded #10 or lower came from the Buckeye State and have won in the Round of 64 since 2009. Their nine teams are three more than any other state. Not sure if that’s statistically significant, but if you’re picking between two upsets and one is from Ohio. 9. First Round Luck and Later Round Talent Not a surprise that upsets happen far less frequently past the first round. There’s just less teams and better teams at that. Only twenty-three teams seeded #10 or lower have moved on past the second round since 2017. On top of that twenty of those teams were specifically seeded between #10 and #12. 10. Talent Becomes More Important Deeper into the Bracket While these mid-major teams advanced past the first round, the numbers have to be paid attention to in later rounds. With 12 of the 23 teams that reached at least the Sweet 16 in the past 10 years having come from a major conference, things don’t look good for the small guy the deeper we get into the tournament. 11. Never Personal As much as you’d hate to go with your Alma Mater or one of your favorite teams with one of your favorite players, you have to keep that compartmentalized if you’re predicting using our 10 years of research. Stick with the likelihood and not your gut. 12. Going Big or Going Home So while your gut is to pick that smaller school from a smaller conference seeded #13 to upset a powerhouse in the first round, you’re better off sticking with college basketball’s Blue Bloods and big name programs as the tournament progresses, regardless of how much they seemed to be struggling and how badly you want the small school to defeat Duke… or any other team. While 2018 was the year of the upset, highlighted by aforementioned UMBC’s win over Virginia and Loyola-Chicago shocking team after team on their way to the Final Four (before losing to Michigan), if our data is to be heeded, it’s more likely that the Blue Bloods, the higher seeds and more familiar college teams are the teams that will ultimately make the deepest runs. We all love a great underdog story, but our cheering for that small time college going all the way is purely-based on emotion, if you’re looking to make picks based on numbers, we’d place our bets on a team that’s tried and true.